You all know that I am a huge fan of protective styles. Protective styling is beneficial for multiple reasons, but the main reason I turn to it is when I am in need of a break from doing my hair. When I feel like I need a break and/or something new, I turn to protective styling for fun and low maintenance. Some of the most common protective styles I have worn are braids and curly hair sew-ins. I wanted to step out and do something different this go round. Thanks to Perfect Locks I am trying a new look. How about some wavy hair action? 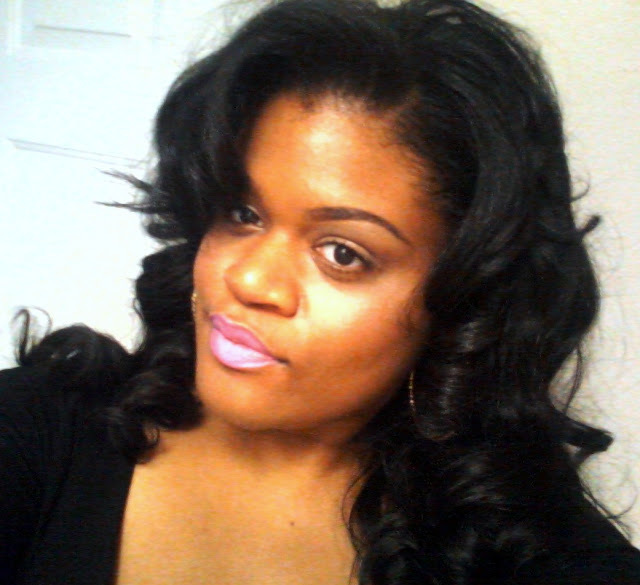 When selected to review the hair, I chose the Wavy Virgin Indian Hair in two bundles of 16". I made this selection because although I have never worn virgin hair, I have heard that wavy hair is more practical. It can be worn straight, curled or in its original state as wavy. I also chose this length because I wanted it long enough to put up into a ponytail or bun, but not extremely long. The shipping took around two weeks to receive. Depending on how quickly you need the hair, there are quicker options for you. When the package arrived, I was impressed with the packaging because beyond coming in a paper priority mail envelope, it was protected in a purple sack. The sack contained the bundles of hair, which were also sealed in a plastic bag the length of the hair. 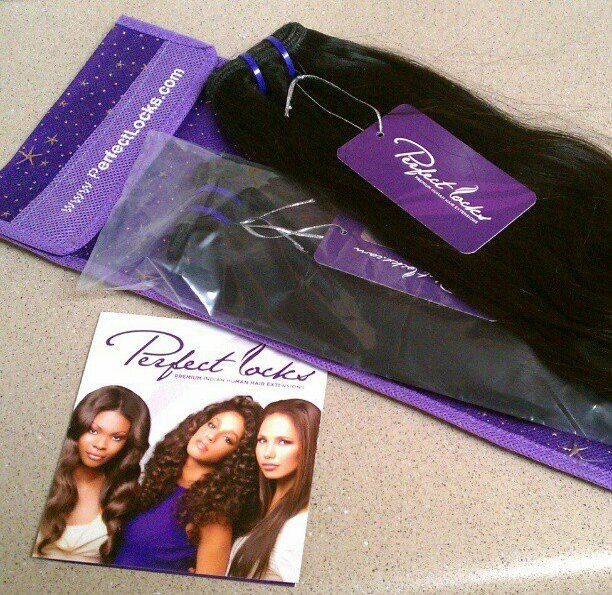 Also, each of the two bundles were clasped with purple holders and a Perfect Locks label indicating the type of hair. After taking the hair out of the package, I immediately noticed how soft it was. I could tell a huge difference between virgin hair and beauty supply hair. I also noticed that the wefts for each bundle were already sealed. 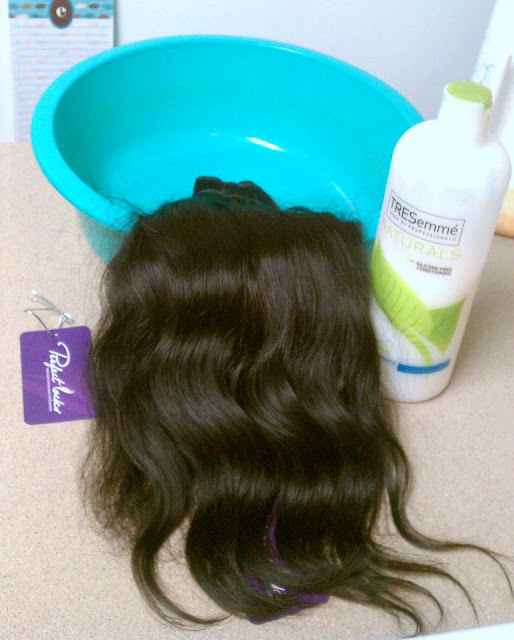 Sealing the bundles allows the hair to last longer and shed minimally. At the advice of my stylist, I co-washed the hair prior to installation. Since I am supposed to treat this hair as my own, I decided to use the same products I would use on my own hair. I co-washed the extensions with Tresemme Naturals Conditioner. I then combed the hair and allowed it to air dry for two days. After co-washing the hair, the hair became much fuller and even softer. As for shedding, the hair only lost one to two hairs after combing. I had my hair installed on Saturday. My stylist and I agreed to do a partial sew-in so my natural hair was left out along the edges and a little bit more was left out at the very top of my hair. My stylist braided the hair in the middle of my head and then began sewing in the extensions. After completing the sewing, she used RedKen Ultra Straightening Spray and flat ironed my edges. 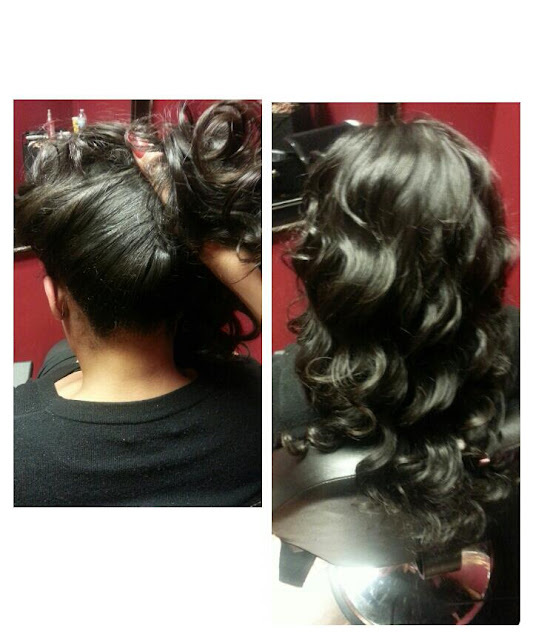 She then curled the extensions with a curling wand. My hair blended extremely well with the extensions. So far, I am just swirling the hair into a low bun and wearing a satin bonnet. Both my natural hair and the extensions have remained smooth underneath. Overall, I am extremely impressed with the hair. The hair is extremely low maintenance and when I take my bonnet off in the morning, it kind of just falls into place. Although it sometimes tangles where the hair rubs against my clothes, the tangles are minimal and are easy to get rid of without shedding. I will be doing two more updates on the hair in the coming weeks. I can't wait to share more of my experience with you! What do you think? Are you a fan of sew-ins as a protective style? P.S. Don't forget to enter to win tickets to the Curls Gone Wild Tour. Enter here. It looks really good and natural! I've never tried virgin hair either but I hope to one day. Once upon a time I was the self proclaimed Queen of Sewn Ins, so I absolutely love this. Looks beautiful on you. I've been considering getting just a straight sew-in for maybe the Fall. Definitely going keep Perfect Lock in mind. About how much do they cost? Love love your hair! Looks so good! I can't say enough about have quality hair for a sew in! Wear sew-ins majority of the time. I like NO maintenance styles! LOL! LOL! Thanks Trina! I definitely could get used to this. So much more time to do other things in the morning now! Thank you so much girly! The stylist used a blow dryer, heat protectant and flat iron to straighten my hair in the front. In the beginning, I was just sleeping in a satin bonnet and it worked fine. Now that the hair is almost a week old, I am putting a satin wrap around my edges and wearing a bonnet. If your hair reverts easily, you may want to wear a curlier look so you don't have to use much heat. Ashley this hair is so pretty on you! I'm glad you are liking it so far! I LOVE IT! Looks really good on you girl! I love it! love this hair on you! I'm the biggest fan of sew-ins. I have one in right now, that I've had in for almost two months now. I'm taking it down soon and going into another one. I tried virgin hair for the first time and I'm not too thrilled about it - shedding to the extreme. Definitely gonna try a new brand. Thanks for stopping by Kara! I have always worn curly hair sew ins so this is my first time with something like this. I noticed more shedding, but I have heard it's normal within the first few weeks. What type of hair do you like to use? Your hair looks great!! I've been wanting to get a protective style for a while. I haven't been able to decide between braids or a sew-in. Thanks! I think braids would be so cute on you and extremely low maintenance. Thank you so much! I am enjoying this low maintenance.